Not to be confused with Pilot engine. In railroading, the pilot (also known as a cowcatcher, cattle catcher or cow plow) is the device mounted at the front of a locomotive to deflect obstacles on the track that might otherwise derail the train. In addition to the pilot, small metal bars called life-guards, rail guards or guard irons (UK) are provided immediately in front of the wheels. They knock away smaller obstacles lying directly on the running surface of the railhead. Historically, fenced-off railway systems in Europe relied exclusively on those devices and did not use pilots, but that design is rarely used in modern systems. Instead of a pilot, trams use a device called a fender. Objects lying on the tram track get hit by a sensor bracket, which triggers the lowering of a basket-shaped device to the ground, preventing the overrunning of the obstacles and dragging them along the road surface in front of the wheels. In snowy areas the pilot also has the function of a snowplow. The pilot was invented by Charles Babbage in the 19th century, during his period of working for the Liverpool and Manchester Railway. However, Babbage's invention was not built, and it is uncertain whether later users were aware of Babbage's idea. On a mainline locomotive, the pilot has to successfully deflect an obstacle hit at speed; the ideal is to push it upwards and sideways out of the way. The locomotive should not lift on impact or the train will follow, and the ideal is for a fairly smooth structure so that the locomotive will not get caught and derailed. The typical shape is a blunt wedge that is shallowly V-shaped in plan. In the later days of steam locomotives, the front coupler was designed to swing out of the way also, so it could not get caught up; this was called a 'drop coupler pilot'. Early on, pilots were normally fabricated of bars mounted on a frame; later on, sheet metal pilots were often used for their additional smoothness, and some cast steel pilots were employed for their mass and smooth shape. Early diesel locomotives followed the same plan. Early shunting locomotives often had a pilot with steps on it to allow yard workers to ride on the locomotive; these were called 'footboard pilots'. In some countries, footboard pilots are outlawed for safety reasons, and have been removed. 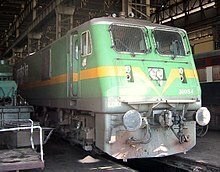 Modern locomotives often have front and rear platforms with safety rails where workers can ride. Most modern European rail vehicles must have pilots with snowplow function and rail guards by law. The required strength of the system is 30 kN (3,059 kp) in the middle of the track and 50 kN (5,099 kp) near the rails. Modern US diesel locomotives have flatter, less wedge-shaped pilots, because a diesel locomotive has the cab near the front, and the crew are vulnerable to impact from obstacles pushed up by the pilot. Anti-climbers engaged on two Washington Metro rail cars following a collision in June 2009. 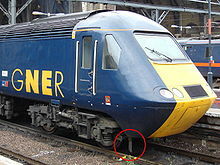 To protect the crew and passengers, most modern locomotives and passenger cars have a device known as an anti-climber fitted above the coupler, which is designed to prevent colliding vehicles from travelling up over the frame and through the locomotive cab or passenger car. Where a pilot is not fitted, a different type of anti-climber may be used. This is to prevent one passenger car from riding up over another, or telescoping in a collision. ^ Hyman, Anthony (1982). Charles Babbage, Pioneer of the Computer. Oxford University Press. pp. 142–143. ISBN 0-19-858170-X. Babbage suggested to Hodgson of the railway company what was later to be called a 'cow-catcher' for sweeping obstacles off the line. ^ "§ 41 Bahnräumer und Schienenräumer". Verordnung über den Bau und Betrieb der Straßenbahnen (Straßenbahn-Bau- und Betriebsordnung - BOStrab). (in German). 2008-11-07. Retrieved 2009-03-29. "Notes and News: Pilot Engines, Past and Present". The Railway Magazine. Vol. 91 no. 556. Westminster: Railway Publishing Company. March–April 1945. pp. 117–118. - describes seven other meanings of the word "pilot" historically used on Britain's railways. "Hubris and the Cowcatcher by John H. White Jr". Railroad History. 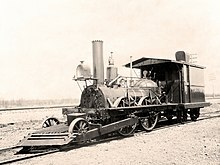 Pflugerville, Texas: Railway & Locomotive Historical Society (215): 86–91. Fall–Winter 2016. - describes Lorenzo Davies, alleged inventor of the cowcatcher. This page was last edited on 21 October 2018, at 20:17 (UTC).